My wife saw this at Hearst Castle in California and loved it. I'd like to purchase one for her. Hi Scott, good choice! 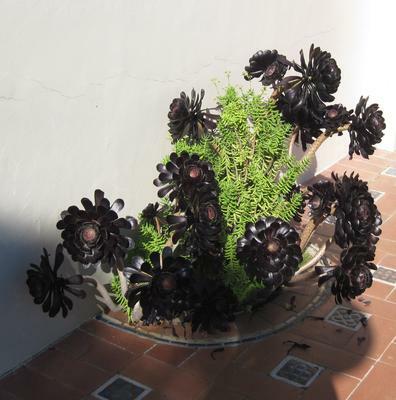 This is one of my favorite Aeonium, one known as Schwartzkopf, which is the darkest red imaginable, in fact as you say, appears black if it's grown in really bright light. You can find out a bit more here: Aeonium. These are different than many succulents; they have a requirement for a summer dormancy, which can make them a little tricky to grow, plus their habit of putting out a bloom stalk after which the rosette dies. The trick is to always prune them, so they make new growth lower down on the stem to take the place of any flowering rosettes. During the later part of the summer, they pretty much stop growing and just wait out the heat, and will start up again as the nights cool off a bit. For winter care, keep them really dry. They will take considerable drying out as long as they continue to get enough light, such as under a grow light on a 12 hour cycle. Keep in mind that these plants originate around the equator, where the days and nights are of equal length.